Protesters gather during a pro-Palestinian demonstration against the Israeli army's attacks on the Gaza Strip in Frankfurt, Germany. 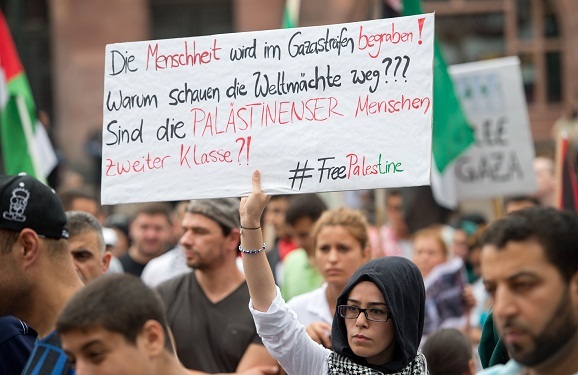 The placard in German reads 'humanity is being buried in Gaza! Why do the world powers watch? BERLIN - Germany&39;s Jewish community on Monday condemned an "explosion of evil and violent hatred of Jews" at a recent string of pro-Palestinian demonstrations in the country. Protesters waving Palestinian flags and signs of late leader Yasser Arafat have in recent days openly shouted angry anti-Semitic slogans at rallies against Israel&39;s Gaza offensive, according to German media. A Berlin imam has openly prayed for the annihilation of Zionist Jews, asking Allah to "kill them to the very last one," according to a video published online by Israel&39;s Haaretz daily. The president of the Central Council of Jews in Germany, Dieter Graumann, said: "We are currently experiencing in this country an explosion of evil and violent hatred of Jews, which shocks and dismays all of us. Pro-Palestinian demonstrations have been held in recent weeks in cities across Europe, including in France where they have spiralled into violent clashes with riot police and dozens of arrests.